Back-Up Story: "The Origin of Sinestro"
It's Hell on Earth-51, the last Earth in the Multiverse, the so-called perfect Earth. Monarch's forces are taking down the remaining heroic forces of Earth-51 such as Wonder Woman and Dr. Fate. Then all Hell truly breaks loose as the Monitors battle Monarch's army. Solomon the Monitor still is reeling that Bob's life force didn't go into him when he killed him. Monarch goads him. Solomon retreats back to the Multiversal Nexus where the remaining Monitors berate him for putting everything at risk for his own personal gain. The remaining Monitors teleport to Earth-51 to join the fight. Solomon realizes that the Monitors have evolved into individuals and they're all too different to recombine. The Monitor who guards Earth-51 hovers in the upper atmosphere looking down on Earth. His thoughts reveal he knew New Earth Ray Palmer was living on Earth-51, and he protected him and kept his existence a secret. Meanwhile in Gotham City, Earth-51's Batman is working on figuring out who these invaders are. This Batman still has Brother Eye - until Earth-3's Super Woman destroys it. As Batman walks through the cave, the foreground image is a costume display - it's a Red Robin costume. Kyle Rayner and Ray Palmer talk. Ray reveals that the Earth-51 Ray was supposed to stop the Great Disaster. Ray is simply trying to continue in his work. They're suddenly confronted by three 'heroes' from Monarch's army. In Gotham City, Donna Troy is attacked by an alternate version of herself who's part of Monarch's army. As they battle, below them, Jason Todd is attacked by one of the Extremists (the creepy tentacle head guy). As tentacle-head tries to push Jason off a building, Jason is rescued by Earth-51's Dark Knight - who is surprised to see Jason Todd. Donna retreats from the battle with her doppelganger. Elsewhere, the battle's being observed by Queen Belthera - you remember her as the bug lady who turned Ryan Choi (the Atom) into a bug much earlier on in Countdown - who apparently has allied herself with Monarch and is in control of the alternate Donna Troy. The bug lady sends her bug drones down to pick the city's bones. Back in the Multiversal Nexus, Solomon laments his mistakes when he's suddenly confronted by Superman-Prime who needs Solomon's help. In Metropolis back on New Earth, a showered naked Forager tells Jimmy that, when they kissed, she sensed in him the "spirit-energy of the Gods" and that she realized Jimmy is a "soul-catcher". In Earth-51's Batcave, Batman reveals to Jason that he eliminated the bad guys like Joker, Luthor, Sinestro, Grundy, and Grodd. Then he tells Jason that Jason Todd died in Batman's arms years ago and that Jason's got 10 seconds to reveal who he really is, or this Batman will shoot him. Sinestro was once a friend of Hal Jordan and a great Green Lantern. He trained Jordan. But Sinestro ruled his planet Korugar like a dictator. Jordan and the Guardians intervened and banished him to Qward. While on Qward, Sinestro was given a yellow power ring. Eventually Sinestro formed the Sinestro Corps. The Sinestro Corps was recently defeated but the Guardians had to rewrite the Book of Oa to permit the rings to use lethal force against Sinestro Corps members. Though Sinestro was defeated, he sees it as a victory in that he corrupted the incorruptible. 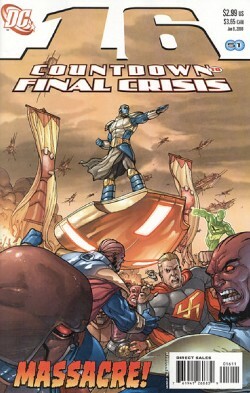 Story - 3: My favorite issues of Countdown are those that tell a story from beginning to end - what I mean is anything other than what Countdown did so wrong in the beginning: telling the five or six main stories with only a page or two available for each so that you have six stories where nothing happens. Keeping most of the issue focused on the Monitor/Monarch war makes me happy - it gives me something to sink my teeth into. So I happily followed a single story (featuring lots of characters) pretty much from beginning to end this issue. By the way, Monarch's army is composed of so many characters who weren't part of "Countdown: Arena"; this simply reinforces how pointless "Arena" was even though I did think it was a lot of fun - like a good popcorn eatin' summer blockbuster. I'm definitely interested in Jimmy's story and this issue's revelations are welcome ones to me. That Jimmy is a 'soul-catcher' means he's probably going to be instrumental in the recreation of the New New Gods for the Fifth World and that - hopefully - whatever he does to bring on the Fifth World will deprive him of his powers and maybe even some of his memories like, for instance, his knowledge of secret identities DCU-wide. The issue loses one rating point (I was ready to give it a 4 this week) when bug-lady showed up. I was hoping we were done with her, that she was one of those so-called early mistakes they'd since rectified in Countdown. Then again, what DC historically does so well (at times) is to take early mistakes and re-spin them into creative gold. So we'll see exactly what her continued interest in Donna Troy (or should I say Donna Troys) is all about. Art - 4: I look at the two-page splash spread in conjunction with the title of the story, and a song comes into my head: "They paved paradise and put up a parking lot." Strangely garbed but slightly familiar heroes fighting other strangely garbed but slightly familiar heroes. While a score card would be nice (who's an Earth-51 hero? Who's on Monarch's team? ), the absolute chaos of the fight and fighters' identities helps to heighten the tension. It seems Monarch with his storm troops is the Darth Vader of this little melodrama. But even after everything I still have a tough time taking Monarch all that seriously in that costume. Overall a pretty issue - though with some inconsistencies probably caused by the issue having three pencillers. Back-Up Story - 4: A succinct summary covering all the character's major beats of recent consequence. Overall I have to say Beatty's origin stories are much stronger than the ones Mark Waid wrote in previous issues of Countdown. Beatty understands how to sum up in an origin story and to show an evolution -- how a character changes to become who he or she is in the present as a result of certain seminal events in the character's past. Back-Up Art - 4: Any artist who depicts Sinestro without that ridiculous triangle shaped head is OK in my book. Cover Art - 3: It's a nice cover but that's about it. Given the story inside, I'd have loved a modern take on the old heroes versus heroes versus yet more heroes covers (like the late 1970's Justice League of America cover with the Justice League fighting the Justice Society fighting the Legion of Super-Heroes) with Earth-51's heroes fighting Monarch and his army fighting the Monitors. There'd have been more room for that type of cover if the shot of Monarch on his hovercraft takes up too much of the cover space. And like I said above, I just don't find Monarch threatening in that Dr. Doom-lite tin can.